One of my good friends at Atmel, Paul Rako, recently sent me a sample of the AVR Dragon (Atmel store page), which is a in-circuit serial programmer (ISP) and On-Chip Debugger (OCD). The ISP functionality is familiar to most hobbyists in the AVR embedded programming scene; through the standard 2×3 pin header, you can erase the flash memory on an AVR and download new program code onto the chip. A typical example of an ISP programmer, and what I’ve been using exclusively up until now, is the wonderful, if sometimes a bit flaky, AdaFruit USBtinyISP. This entry was posted on Thursday, August 8th, 2013 at 1:00 pm	and is filed under AVR. You can follow any responses to this entry through the RSS 2.0 feed. You can skip to the end and leave a response. Pinging is currently not allowed. It is nice to see another person “graduate” to the Dragon. I’ve had mine for years and it has worked flawlessly. Yes you can damage a Dragon if you don’t use common-sense connecting it. Older versions of the Dragon were a bit more fragile, new Dragons are much better. Mine is the older version but I’ve never had a problem. Again, use common-sense when connecting any programmer/debug dongles to your targets. If you buy a Dragon, to really use the power of the Dragon, you will need a bit more third-party hardware pieces to populate it – some 0.1 male and female headers, a 28-pin DIP socket, and a handful of short female-female header jumpers – all available online at very low cost (if they’re not already in your parts inventory). The Dragon has huge advantages over the likes of the simple programmers sold to the “Maker” Community (not that the simple solutions are bad – they have their place): On board programming/test, off-board programming of targets with both ISP and high-voltage ISP (yes you can program fuses), JTAG, and On-Chip-Debug (OCD). When you use your Dragon with AVR Studio, it is automatically (at your choice) recognized and updated. The problem with the Dragon is ATMEL’s documentation. As Kenneth mentions, it is a somewhat steep curve to get to grips with the Dragon. But it is pretty-much all there on the ATMEL site if you dig around. When the Dragon was first introduced, it seems the Marketing Goons at ATMEL decided to software/firmware limit the Dragon’s capability to push power users to ATMEL’s higher priced (outrageous is a better word) development hardware tools. But the user community knew this and after a lot hammering, ATMEL removed most (if not all?) the limitations. Microchip should learn from this example. When I see hobbyists getting trapped into spending $20 for an ISP-only programmer, then finding out they have to spend another $20 on some sort of “fuse-resetter” device, then fighting with AVRDude. I just shake my head. If you’re serious about AVR development just spend fifty bucks or so on a Dragon (plus a few more pieces) and be done with it. I, too, was impressed by the pretty box, and then immediately frustrated because after attaching the recommended ZIF socket, the board no longer fits in the box. Another quarter inch, guys! I soldered a zif socket in the experimenters area so I can do high voltage programming and created tiny pcb’s for different mcu wirings which can be swapped by using headers. Furthermore I’d advice a buffer board to save the dragon’s drivers. If you want to buy one, skip the atmel store and it’s $19 shipping from Malaysia and head to Mouser et al. @Nate B, It may not fit in the box if you put a ZIF socket on the board. But unless you’re planning to be burning a bunch of production chips stand-alone, I do not recommend putting a ZIF socket on the board. Just use two standard female headers and a 28-pin DIP socket. I find very little of my work is done directly on the board – just un-bricking an odd AVR once in a while. @Twinkle, You said, “tiny pcb’s for different mcu wirings which can be swapped by using headers”. That’s a great idea. You should post your project to the forum. @Tom Keddie, I think you mean shipping TO Malaysia, not From. 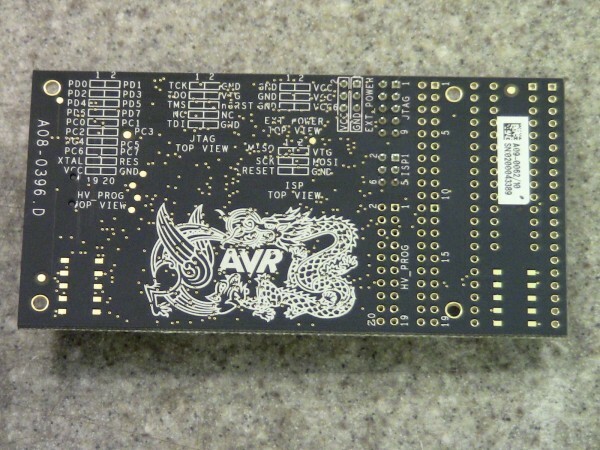 If that’s the case, Element14 (formerly Farnell) in Sigapore stocks the AVR Dragon. Unfortunately, like almost everything else at Element14, the price is quite high – S$73.50 which is around $58.50 USD. But the shipping may be cheap and quick (maybe not though). I originally bought my Dragon from RS-Singapore over the counter, and the price was right. They don’t seem to stock them now. @Drone, yeah, I realize that now, but when I first got it, I was like “populate ALL the headers!” and now I’m not about to attempt desoldering a ZIF socket. @Drone: no I am in Canada. Atmel was only offering shipping from Malaysia for $US19 (they rely on distributors to cover the world for them). This is a sweet case!